Instant gratification anyone? Feeling a little overwhelmed with the number of projects on the go and general life stress, I decided that finishing a lingering project would help turn things around. 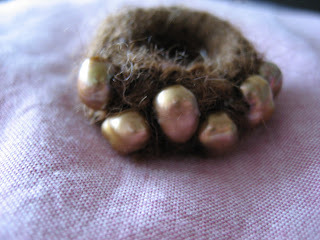 A few hours later and I had a funky knitted ring. A great way to use up those little bits of yarn I can't bear to throw out. Lorna's Laces 10 oz Pencil Roving in Seaside and Tahoe that I picked up here while on summer vacation. 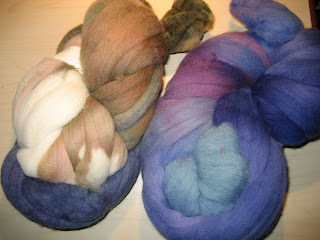 Inspired by this, I decided that I wanted to make a handspun shawl for my grandma out of the purply-blue roving. 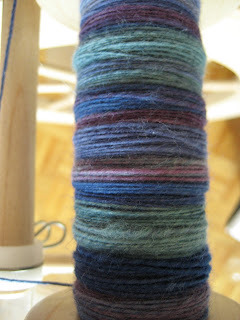 Here's how the first bobbin is going so far. Wish me luck. Posted by Amanda at 4:34 p.m.